A very good friend suggested that I share some of my finds so that you might partake in the fun! From now on, “Psst …” will be the title for posts in which I share discoveries from my shopping escapades. I love a good bargain—I’m married to a super accountant after all. Today I went to the Harry Norman Estate garage sale. Harry Norman was a true Southern Gentleman and a big real estate agent here in Atlanta. The company offices now include Georgia and North Carolina. After waiting for what seemed like hours to get in, I was rewarded with the two red and white quilts and a beautiful pillow cover that you see below. The sale is going on now through Saturday in Atlanta—Normandy Road off of West Wesley. Have a great time! Oh Lissy those quilts would look great in my house! I just love red!!! A great find. The pillow cover is great also! Beautiful!!! Thank you Cathy, I will let you know where they end up—maybe in my red and black bedroom. Great find! Love red! Great detailing on the pillow. 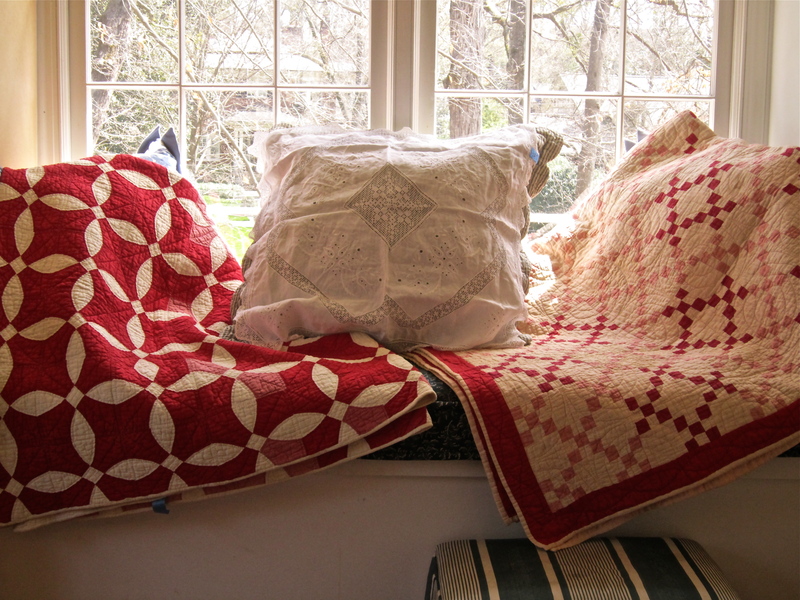 They also have very small hand quilting-perfect for the 3/4 beds in the quest room. I sure hope they fit. This message might sound strange but did you manage to work these two quilts into your house? If not, I would be willing to purchase these quilts from you. Thank you! They did get used … sorry. I will post more pictures later. That’s too bad, if you are ever thinking of selling the quilts, please let me know. Thanks! Looking forward to seeing the photos. I am always looking-will let you know.